Take a moment to evaluate your love for God, your spouse, your family and your friends. Is your love rooted deep like the roots of this tree or is it only on the surface? We live in a world where very few people want to go deeper. We say that we love and are in love, but as soon as something happens we are ready to quit. However, God doesn’t want us to quit, He wants us to be deeply rooted in Him. So what does it mean to be deep rooted? I am so glad that you have asked. 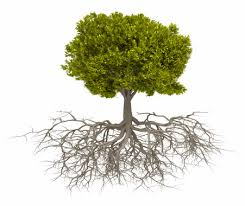 To be deep rooted means to be firmly embedded, implanted, established or ingrained. It also means being fixed, entrenched and settled. When something is deeply rooted, it is strong, and you have had it so long that it is difficult to change. The opposite is on the surface, shallow, slight and superficial. God’s love for you is so deep that it will never fail you. You may have been failed by your mother, father, sister, brother or your spouse, but God will never fail you. When you hit rock bottom in your finances, your marriage or in any area of your life, God is right there underneath of you (Deut. 33:27). He is our refuge. No matter what you have done or how long you did it, God’s love is deep for you. Are you willing to go deeper into your relationship with Him? The deeper we love Him, the closer we get to Him through prayer, reading His Word and learning, His ways/His will. When we have a deep love for Him, we show it by our obedience. He said; anyone who loves me will obey my teaching (John 14:23). When we go deeper with God, our lives will not be the same, and it will impact every relationship that we have. Go deeper!